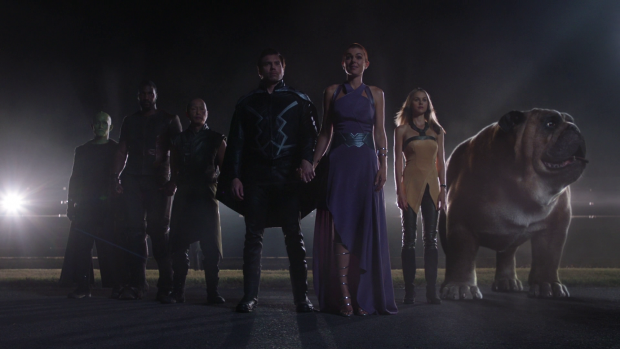 Marvel’s Inhumans ends its first -and possibly only- season with significant changes for the Royal Family and the Inhuman population as a whole. So it’s finally done and if reports about ratings and overwhelmingly negative critical reception are to be believed we won’t be seeing any more of these characters; certainly in their own show. The problems this show has have been well documented by me on this site and I wish I could say the finale was some improvement. The major problem is that the characters really haven’t changed that much -despite how often we are told that they have- so the resolution feels forced and plot driven rather being informed by the characters who should have learned something from the events of the 7 episodes prior to this one. Black Bolt has his name in the title of this episode so the implication is that this episode would focus on him and his changed feelings on what it means to be King. In theory he should realise that the way he was ruling doesn’t work for everyone, it should be apparent that he has been wilfully ignorant of the problems faced by the lower classes and some level of understanding of how his brother feels about the whole situation should have been reached. The reality is that none of that happened. I sympathise with the writers having to work around the fact that Black Bolt doesn’t speak; it’ll be no easy task to develop a character without giving him dialogue. Anson Mount has managed to bring this character to life using nothing but body language and facial expressions. It’s actually really impressive and he should be commended for his efforts. Similarly the writers have done what they can to characterise him through using different shortcuts such as having Medusa translate his own brand of sign language. Unfortunately nothing suggests that Black Bolt has been altered in any way. There have been the odd instances where a facial expression indicated that some statement about class had struck a nerve but that wasn’t evident in his behaviour or decisions so I wonder if that can be attributed to Anson Mount assuming that Black Bolt would have an arc and altered his performance accordingly. Going into this episode there is no sense that he has learned anything so his actions here feel completely unearned. The hook was clearly supposed to be the adversarial relationship with Maximus but they spent so much time apart that this relationship hasn’t been developed. Endless scenes where Maximus talks about how Black Bolt was the favourite son exist but no work has been done to develop how these characters feel about each other. Black Bolt is visibly annoyed at Maximus because of what he’s done but what does that mean for their relationship? I hate to compare this to Thor and Loki but the similarities are too profound to ignore. In those films it’s very clear what Thor’s relationship to Loki is and because of that the betrayal means something because it’s something that Thor really didn’t see coming. That dynamic doesn’t exist here so the betrayal and Black Bolt’s subsequent reaction feel entirely mechanical. 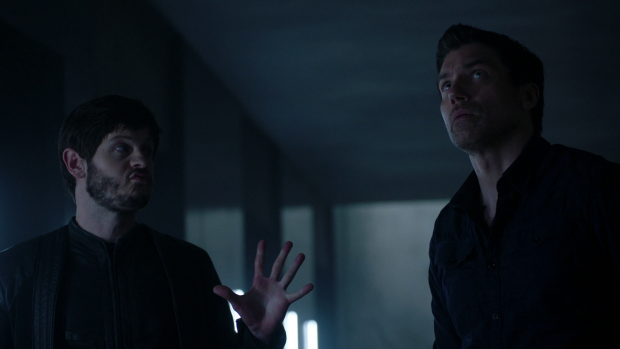 Most of their interactions in this episode involve Black Bolt dragging Maximus through empty corridors while Maximus monologues about everything Black Bolt has been blind to. Maximus gloats while Black Bolt seems mildly annoyed which just isn’t good enough given the weight that should be behind this. It’s barely treated as an inconvenience and Black Bolt seems content to leave Maximus to his own devices most of the time. Black Bolt putting Maximus in the Bunker while establishing that it will survive the destruction of Attilan should also be powerful. He can’t bring himself to kill his brother but also recognises that his crime can’t go unpunished so Maximus is sentenced to a lifetime of solitude in a place where he can easily survive but can’t escape. Such a decision is profound and Anson Mount’s performance shows how difficult this is but as I’ve said there’s no weight behind it because the closeness of this brotherly bond has never been established. 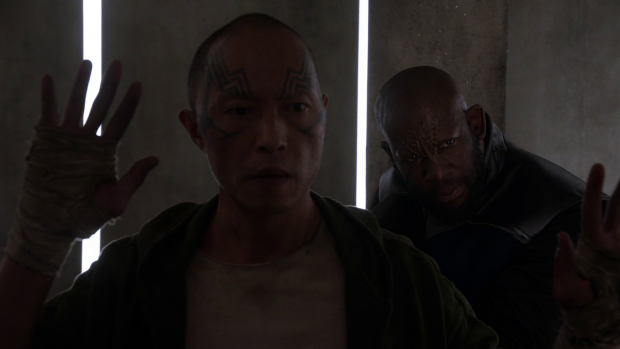 As far as the show is concerned Maximus might as well be a criminal that Black Bolt didn’t know before he staged the coup so none of it really works. The reveal that he forged documents that led to Black Bolt accidentally killing their parents is so poorly handled that it feels pointless and nothing is done with the information after it comes out. It also doesn’t help that Black Bolt whispering “goodbye brother” to level the entrance to the Bunker comes across as more comedic than dramatic. This being only the second use of adult Black Bolt’s powers in the entire season is another disappointment. Maximus himself is poorly handled here. I’ve mentioned in previous reviews that he has been turned into an insane despot rather than the nuanced people driven antagonist he was in earlier episodes. I suspect this shift happened because the writers could think of no other way to make the Royal Family sympathetic. It changed the show from a half baked exploration of class inequality to the lesser of two evils bringing down an insane tyrant. Making Maximus less sympathetic did nothing to endear the Royal Family but it did change the narrative to turn Maximus into a self serving liar who has to be stopped; this is not good storytelling. This episode has him continue to be completely insane. He senses his hold on Attilan slipping away and decides he would rather destroy it than hand it back to his brother. This further shows how little he cares about his people and how much of a lunatic he is. With a little bit of work this could easily have been framed as a positive decision as far as Maximus sees it. If his desire to do what is right for his people and abolish the unfair caste system had remained genuine then destroying Attilan could have been his way of forcing a change that would be beneficial for the people. If running Attilan on limited resources was only possible because of the caste system then forcing an exodus to Earth with the destruction of it would seem like the perfect way to force change. Unfortunately Maximus’ decision is motivated by the selfish desire to not give up the throne so the character is completely wasted. His plan to go through with Terrigenesis once again is all but forgotten other than a brief mention leaving the inclusion of Dr. Declan to be a complete waste of time since the possibility goes nowhere despite being a significant subplot throughout the season. Iwan Rheon always gives his best in this role but there’s only so far he can take it when the writing for the character is so bad. Maximus comes across as petulant when it becomes clear that he will lose the throne and this is really the only way to play that considering how poorly this whole thing has been handled. Auran’s dissatisfaction with Maximus’ leadership is barely covered here despite the significant showing it was given last week. This episode does have her turn her back on him and act as a go between during his conversation with Medusa but she fades into the background once her role in the plot was done. The rest of the characters are barely involved other than simply being in the scenes to deliver some of the dialogue. This should be an important episode for Medusa considering all that she is supposed to have been through in the prior episodes. She has a scene with Louise where she promises to put her father’s ashes on the Moon though that isn’t why Louise is in the episode when that should be the emotional foundation. Louise appears in this episode so that she can help them find a home on Earth which seems baffling considering she has no authority to make that decision. It’s handled as a quick aside and we are simply supposed to accept that it’s all in hand. Her scene with Maximus is actually very strong as it does play on established history. This hasn’t been brought up since the first episode but the idea that they were once close until she became Queen was there prior to this episode. Iwan Rheon steals the scene with a showing of vulnerability from Maximus who admits that Medusa’s dismissal of him following the Terrigenesis making him genetically human was something that hurt him greatly. He mentions that she was his only friend. It’s a solid reminder that Maximus is a very lonely person at his core and feels betrayed by those closest to him. Medusa actually admits to mistreating him, ignoring him and generally being a bad friend. Serinda Swan’s performance suggests regret but it is also quickly pushed aside without being fully explored. It basically devolves into Maximus being wrong and Medusa being right which completely ignores any complexity within the framework of the show and their relationship in particular. It’s also disappointing that she has been without her hair and therefore her powers for almost the entire season. The resurrection of Gorgon proves to be almost pointless. He spends most of the episode growling and grunting to suggest that some kind of crime against nature has been committed. It is treated as something unnatural and there is a promise of punishment of some sort for Karnak that never pays off in any way. 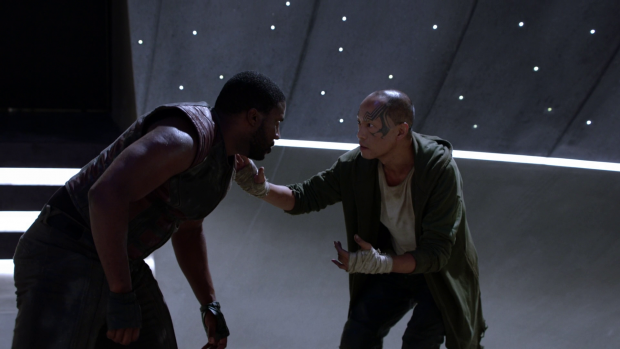 It does allow some opportunity for Ken Leung to emote. The regret Karnak feels for the decision he made is clear and there is a lot of heft behind the scenes he shares with Gorgon. It brings some insight into Karnak as a person as he owns up to his mistake and promises to make up for it while sincerely apologising for what he did to his friend. Again, none of this pays off because there isn’t time but what we do see is well done. Unfortunately the writers seem to forget about his powers on several occasions such as when a guard sneaks up on him and his failure to anticipate when Gorgon will attack him. Gorgon himself isn’t really a character at this point; he’s another piece of furniture used to give Karnak something do. Relegating him to a confused individual struggling with his bestial nature does him a disservice especially considering the potential for this character to be fun and light hearted. Crystal does absolutely nothing in this episode other than talk to Eldrac to ask for his help in evacuating Attilan which he immediately accepts. It’s completely pointless as scenes go and tells us nothing about Crystal. The rest of the time she fades into the background and does very little. 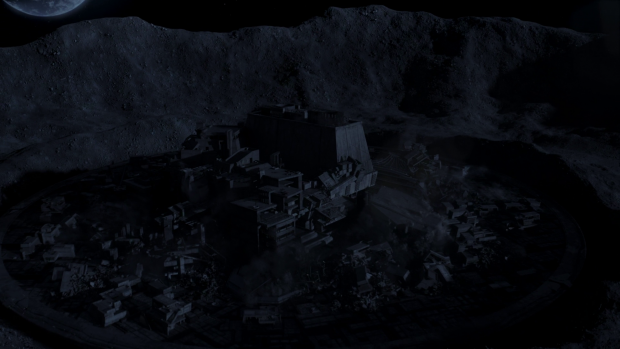 The destruction of Attilan itself was reasonably effective. I really liked seeing the structures collapse soundlessly to allow the emotion to sink in as well as delivering some semblance of scientific accuracy. It fails somewhat because Attilan has never been established as a place worth saving so there’s no real connection to it. 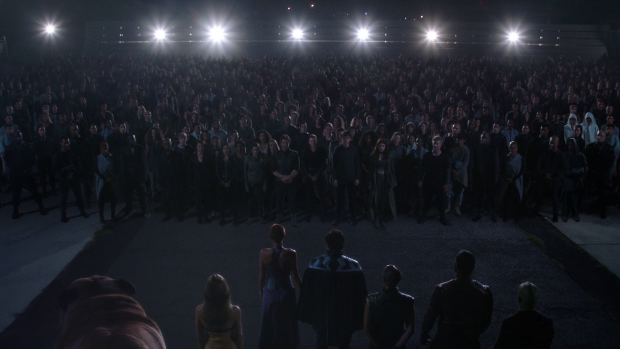 Ending the episode with the Inhuman population on Earth is all well and good as it signifies a new beginning for the people but it’s all left up in the air as to what will happen. Since the show did little to explore what the people thought about the Royal Family as rulers there’s no real sense of how this will go now that they don’t necessarily have to accept the leadership of Black Bolt. It more had been done to establish how Black Bolt was regarded by the population in general then the concept of a new beginning might have come through more strongly. There is also a hint of some greater enemy out there that threatens the Inhumans now that Attilan is destroyed but it’s little more than a hint with a close up on the glowing throne as the city crumbles. I’m guessing that threat is the Kree but we may never find out. Another huge disappointment for this season -probably series- finale is that almost no powers were shown. I’ve alluded to this earlier in the review when talking about Black Bolt and Medusa. The only person using their powers in this episode is Black Bolt though Gorgon arguably uses his when throwing Dr. Declan across the room and killing him. Lockjaw is also seen teleporting but that’s all we get. This show has generally been very stingy with the use of super powers which does further disservice to the characters as part of who they are should be defined by how they choose to use those powers. We can only know how dangerous Black Bolt’s power is if we actually see him use it which doesn’t happen outside of some brief moments, Medusa’s hair could be used to show how hard she works to restrain herself from acting out her darker impulses, Karnak’s abilities show how great a strategist he is, Gorgon’s abilities should establish how passionately headstrong he is and Crystal’s elemental abilities could easily be used as a metaphor for growing up. Each of them could be attributed to a different emotional state and her arc could be focused around learning how to control those emotions in a way that makes her a better person in some way. I feel that the writers saw these abilities as an inconvenience that they had to write around rather than make them a foundational part of the individual character arcs. An underwhelming ending for an underwhelming season. This episode fails to allow the relationship between Maximus and Black Bolt carry it because the show barely established that they have one. Black Bolt doesn’t appear to have learned anything about being a better leader and Maximus is now characterised as being selfish and insane which frames the narrative as him being someone that needs to be stopped by the lesser of two evils. Despite an effective scene between Medusa and Maximus there’s no real sense that Medusa has learned anything either so the emotional hook that needs to exist to have this work just doesn’t exist. The problem this show has is being too plot driven rather than character driven so the characters are disadvantaged as a result. Gorgon’s resurrection is a good example of that as he is simply shown grunting and growling with shades of his personality returning. This exists to give Karnak something to regret but it feels pointless as it never pays off. The ending also lacks weight as little has been done to establish how the people of Attilan view the Royal Family at this point and the suggestion of a bigger threat waiting to strike will likely never come to anything considering the show is unlikely to continue.